After a long, unplanned, and relatively unpleasant break from reading and reviewing whilst I learned to readjust to the lifestyles of the employed, I felt like I should make my next review very detailed. However, Priceless: How I Went Undercover to Rescue the World's Stolen Treasures (Crown), by Robert K. Wittman and John Shiffman, happens to be a real-world tale of suspense, high-stakes art theft and illicit black market deals, so detailing the contents would prove rather counterproductive and irritating. Priceless begins in medias res, with our real-life hero, FBI agent Robert K. Wittman, cruising around on an FBI-chartered boat loaded with FBI-chartered bikini babe agents and FBI-chartered champagne, as well as a couple of French crooks. Wittman introduces the holy grail of his career here - the pursuit of the items stolen in the Gardner heist (don't google it if you don't want spoilers). He goes on to describe the immediate setup and the cast of characters, and then the book flashes back to the beginning of his story. Upon entering the FBI, a dream he had pursued from youth (despite being sidetracked by a lengthy stint as an ad man for a farming magazine), Wittman immediately landed in the so-called art crime division. At that time it was a technically nonexistent department consisting solely of his mentor, Bob Bayan. Shortly after Wittman’s arrival, a Rodin sculpture disappears, and as Wittman recounts the investigation into and subsequent recovery of the piece, he patiently explains something a lot of people don't know: art crime is a relatively new form of criminal activity, tied to the incredible rise of the auction values of famous works during the 20th century. (I was certainly unaware of the facts, having only contemplated art crime as the pastime of dashing billionaires in the image of Pierce Brosnan.) 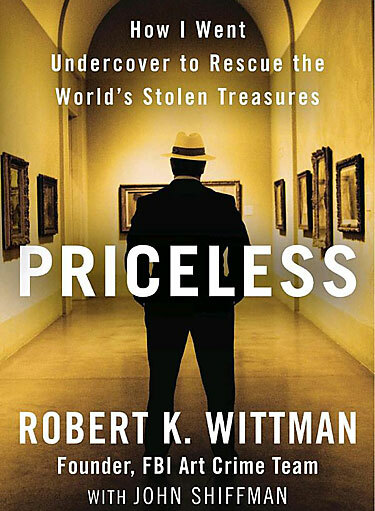 The ensuing chapters illustrate the rise of art crime slowly, almost subliminally, as Agent Wittman recovers artifact after artifact with the help of international agencies, honest art brokers and even illicit collectors who found stolen art impossible to sell and therefore completely worthless. The crimes slowly grow more brazen and the recoveries more tense, and as the book progresses, it imparts a lasting knowledge of particular museums, famous families, the lives and styles of oft-stolen artists and one hilarious FBI prank. The end of the book, however, is extremely cunning in its subversive message. During Operation Masterpiece, the endgame investigation alluded to in the prologue, Wittman reveals a depth of in-fighting and petty politics endemic to law enforcement across the globe, highlighting not only the Byzantine politics of the FBI but also the extent to which other countries will go, even during a high-profile investigation, to seize glory for themselves. During the chase for the Gardner pieces, Wittman not only survives botched stings that roused the suspicion of organized crime families and motorcycle hitmen (not really a spoiler; he did write the book, after all), but also the bureaucratic stranglehold of the international task force. I won't give away the ending, although close followers of the goings-on of the art world already know the story. Even though I'm not a real crime or biography reader, I found Priceless both educational and entertaining, and certainly one of the better nonfiction books I have read in the past year. I've been waiting for this book to come in at my library FOREVER. Have you tried requesting it through interlibrary loan? If the wait at your library is crazy long, you might be able to find an available copy at another library somewhere else in the country and get it shipped to yours.